Are you in search of a soothing environment for a perfect vacation destination? 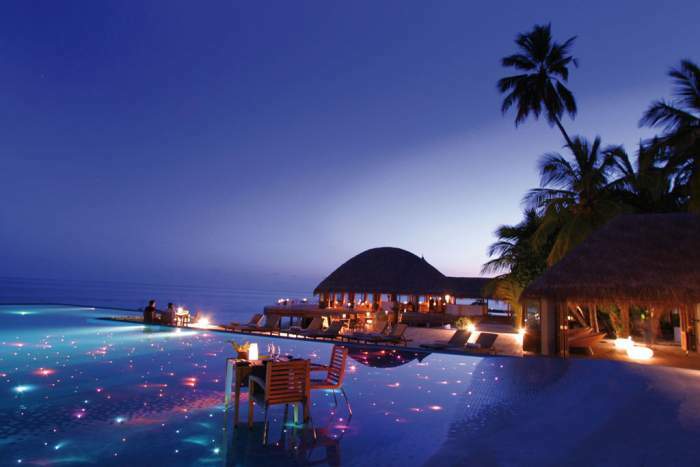 Switch your channel to the beautiful scenic beauty of Maldives resorts. The crystal clear turquoise water, soothing breezes, white sand beaches, and diversity in marine species await travelers in the islands of Maldives! These best Maldives resorts offer you an unforgettable holiday experience. This lavish resort in Maldive is 25 minutes from Malé International Airport via speedboat, the Banyan Tree Vabbinfaru offers villas with private pools, scuba diving or long romantic strolls alongside the beach. With panoramic sea views, the rooms directly use the beach and huge sundecks. The picturesque sunset and sun falling behind the horizon is something you don’t wanna miss and therefore credits to be one of the best trip destinations. Facilities: Banyan Tree Spa, Marine Center, Banyan Tree (Gallery), Diving, Wi-Fi, Water Sports, Currency Exchange, Fitness Center. The exquisite Centara Ras Fushi Resort & Spa Maldives is 20 minutes away from Velana International Airport by speedboat, in North Malé Atoll. It’s crowned as the perfect getaway for a honeymoon or a bachelor’s party! This is a choice of beachside or overwaters accommodation to choose from. There’s something for every age group as kids are offered with engaging beach games, snorkeling, and other water sports activities. The resort is spotted nearby the best diving sites in the world. Facilities: Free High-Speed Internet (WiFi), Restaurant, Breakfast included, Spa, Room service, Fitness Centre with Gym / Workout Room, Bar/Lounge, Pool. This Sun resort is centered all over some popular dive sites. It’s a 40-minute seaplane ride from Male International Airport. This resort has something to offer for everyone. From head to toe, you will surely not miss anything starting from the most sensuous spa massages, perfect workout session in the gym, courts to play tennis, squash, and table tennis courts along with a number of water sports activities and also the best part is there are cooking classes for kids! They offer a variety in every manner ranging from the place where you stay up to the meal you would be offered. 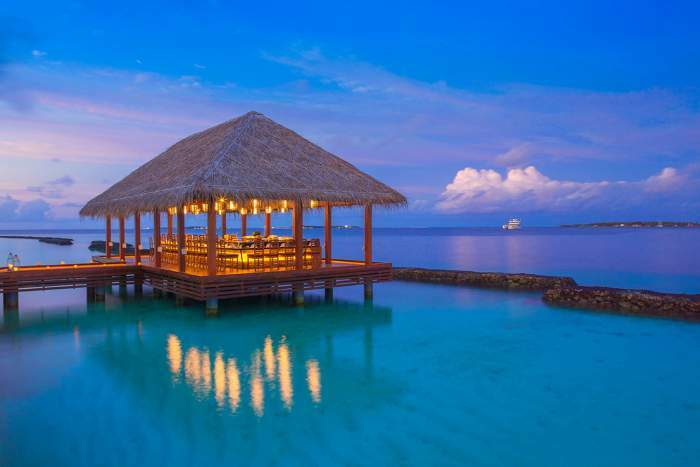 This beauteous resort is nestled on the astounding Maldivian island. It’s an hour away from the Malé International Airport by sea. The resort will just give you the feeling of your own home! Nice? They offer you the most luxurious facilities – Wi-Fi, air conditioners, flat screen, spas, a kids club, water sports, and diving centers. The resort enwraps 12 dining options, kids club, and a spa. You will find the Kuramathi Island Resort is one of the most hospitable resorts in the Maldives, making you feel like to visit time and again! 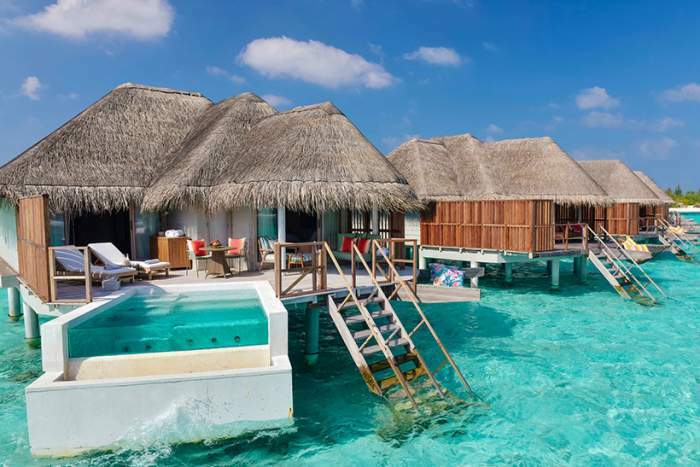 Sort of an exclusive refreshment and retreat is what Gili Lankanfushi Maldives is all about! It’s 20-minute speedboat ride from the Male International airport. The adorable place offers you closeness to the Sun, the sea and its serene breeze, and the nature itself with its accommodation. The resort is decorated with facilities of private sun decks, a water garden topped with minibars and espresso machines in your private eco-friendly abode. Relaxation time is their priority! As they offer yoga classes, ayurvedic treatments, and spas. There are many other leisure pursuit activities like tennis, island day trips, and scuba diving. The most exciting part is that they have got a chocolate cave and a wine cellar. Doesn’t it sound amazing? Surely it does! Huvafen Fushi or Nakachcchaafushi is a private resort situated near the capital, in the North Malé Atoll, Kaafu, Maldives Indian Ocean. It’s a 0-minute speedboat ride from Male International Airport or 15 minutes if you prefer a seaplane ride. Pored in luxury, you can expect here spacious bungalows with its own sundeck, private pool, rain shower, bathtubs, Wi-Fi, large screen satellite TV, Bang and Olufsen speakers, and even slippers. They even offer visual treatments, and if you decide to take body treatments – as the treatment rooms are underwater, as it’s facilities include the world’s first underwater spa. OMG! Feeling like hit the place right now! Don’t you? One one of the best dining here gives you the experience of a live kitchen. The cherry on the cake is the inclusion of an infinity pool and yoga pavilions. 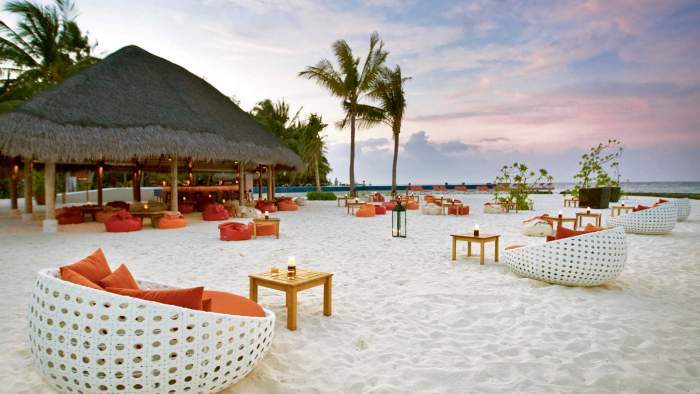 It’s regarded as one of the best Maldives resorts you will find. Giving your journey an extraordinary twist, then pave your way to the One & Only Reethi Rah, 45-minutes away from the Male International Airport. Their hospitality includes elegant services in the Maldives. The icing on the cake is the beach club here – separate for kids and teenagers. The panoramic view like Hollywood is worth watching! Surreal I can say! The resort is crowned one of the best vacation destinations with your loved ones! 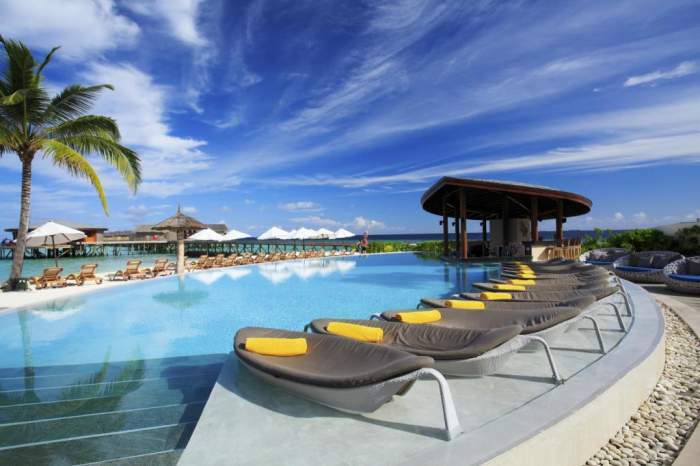 Facilities: Water Sports and Activities, Pools and beaches, Excursions, Spa and Fitness, restaurants, bars, and lounges. The classic W Retreat & Spa is located on a private island in the North Ari Atoll, W Retreat & Spa is a 1.5-hour speedboat ride from Male International Airport. Having a ride on the seaplane will only take 15 minutes away from the airport. Find the solution for all your tensions! This tranquil getaway destination features hitting the right note of enjoyment right from an infinity pool to spas and water aerobics. Facilities: W Private Yacht, Spa, gym, diving, fitness centre, pools, Kayaks, SeaBob Lessons, Kite Surfing, Tour/Excursion Service, Aqua Aerobics, Boat/Catamarans Rentals, Billiards Table, Snorkeling Equipment, Yoga Classes, W Lounge, Sun Deck, Wi-Fi, and High-Speed Internet Access. The Six Senses Laamu is geographically positioned on the Olhuveli Island which is a 35-minute inter-island domestic flight away from Male International Airport to Kadhdhoo, by taking a short speedboat ride. A worthwhile luxury resort in design offers exclusive rain shower under the stars, private treatment rooms, sun lounges, on sight diving centers, yoga pavilion and more. 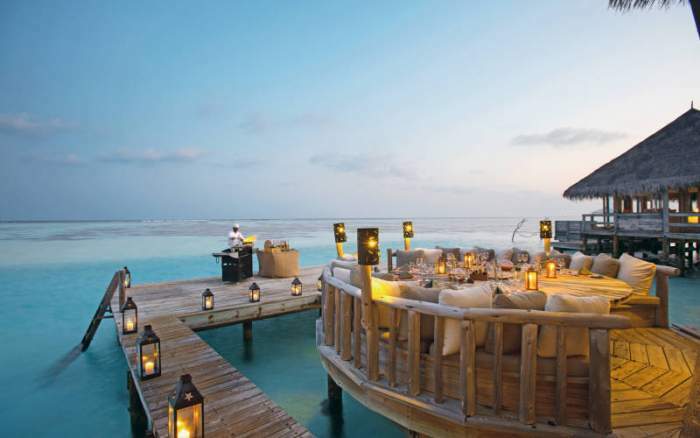 Six Senses Laamu is the single resort you’ll spot in the Laamu Atoll. 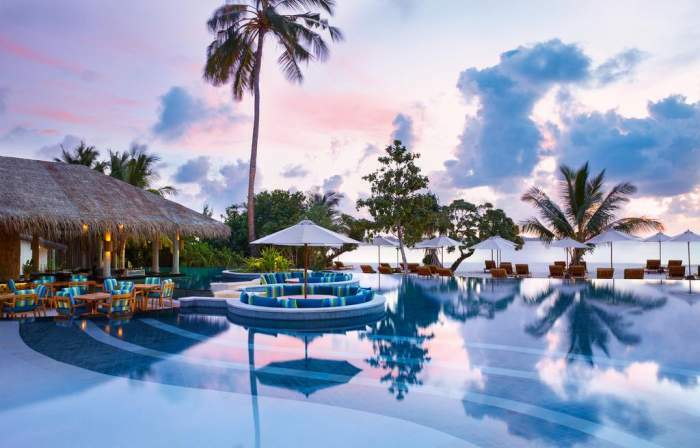 This exotic Shangri-La’s Villingili Resort and Spa are at a distance of 70-minute flight from Malé International Airport and a 5-minute boat ride from Gan Airport on Addu Atoll. The resort boasts an infinity pool, spa, and a 9 hole golf course! Incredible hospitality is a proved one as guests here are welcome with open arms to explore the neighboring islands by cycle, work out or just chill by the poolside, getting sun kissed. This resort is home to spacious villas hidden among dense plants on a private island, a 30-minute seaplane transfer from Male International Airport. The place is all about private beaches, private gardens with signature bathing areas outside add stars to your nights. Add-on services include butler service, a high space observatory, and six different restaurants. A full stop hasn’t been applied yet! Hit the glass blowing classes, yacht sailing, and water rides. 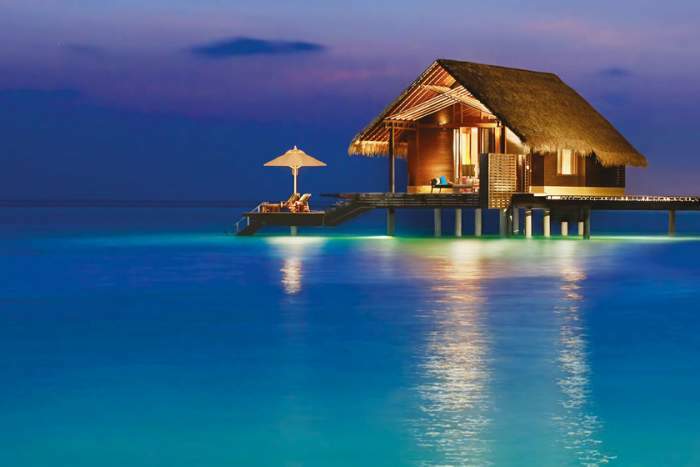 This accolades to be one of the best Maldives resorts and is amongst the best travel destinations for a honeymoon. 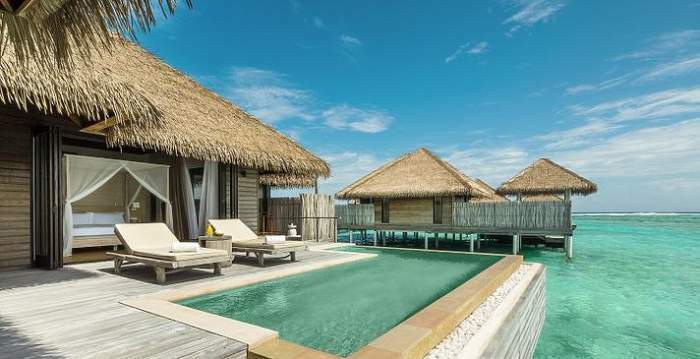 COMO Maalifushi is the one and only resort to open in the Maldives’ Thaa Atoll, located in the island’s southern reaches. It takes 60-minutes by seaplane to reach the resort from the Male International Airport. With overwater villas and beach suits, COMO Maalifushi is, therefore, the perfect place for surfers and divers, families, and couples. There are some excellent breaks with the addition of an array of private islands. Cheval Blanc Randheli finds its place in the world’s most stunning resorts along with the Chedi Muscat and many Aman resorts. 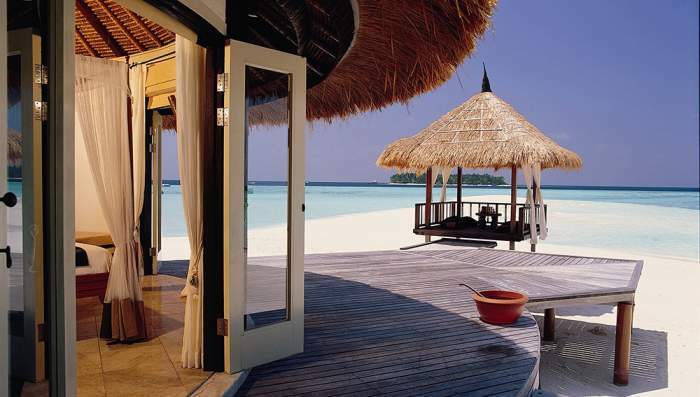 Randheli is one of the top luxury resortsin the Maldives. It’s 40 minutes by seaplane from Male International Airport. The resort offers 45 loft style villas with an architectural sequence of 7-meter-high doors creating a spectacular sense of place. The design is more smooth, stylish, and fascinating than in any other resort on the list. 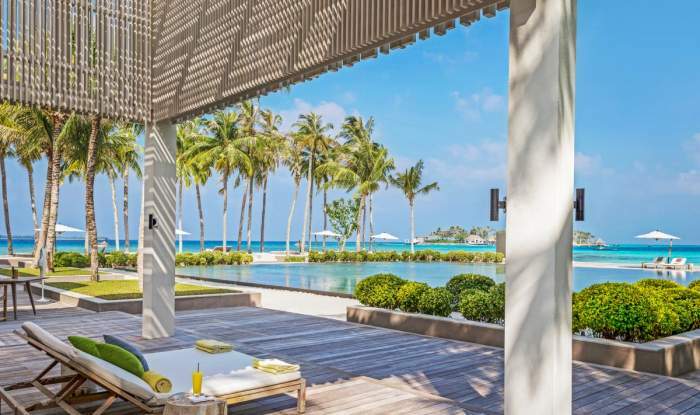 The villas of Cheval Blanc Randheli just the best in the Maldives. They are damn beautiful, huge, and the decor is out of the world. 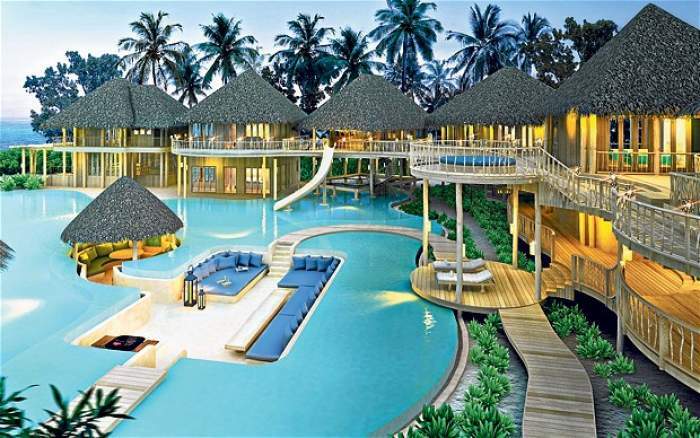 It’s one of the best Maldives resorts.